Classic Elite Yarns: Thanks Julia! We have been fortunate enough to work with great designers over the years, and Julia Farwell-Clay is certainly one of them. Her most recent work, found in From Folly Cove (at your LYS and on Ravelry) is breathtaking, and full of historical information as well as inspiration. Thank you, Julia, for allowing us to publish your beautiful work. Did you see Julia's blog tour? - some great bloggers had a lot of insights! 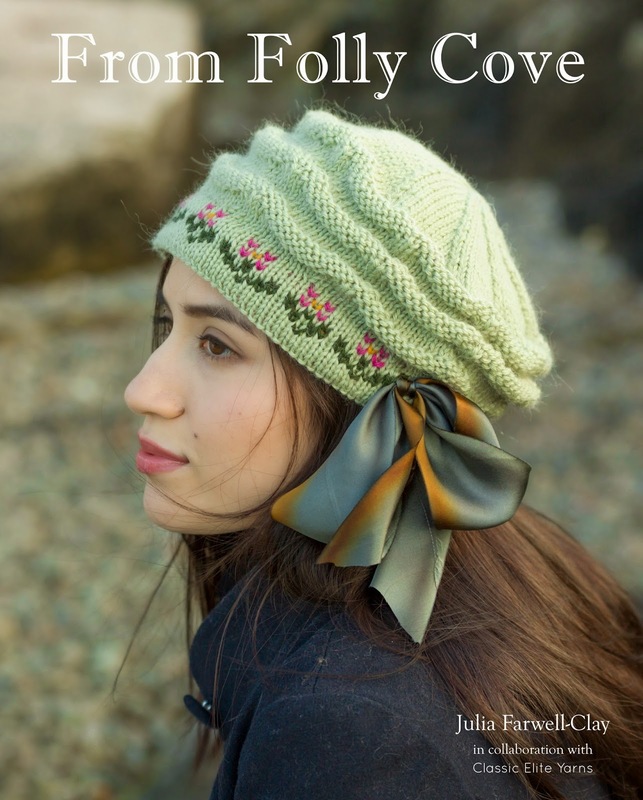 Leave a comment here before 5:00pm eastern time February 26th, and maybe you will be lucky enough to receive the From Folly Cove and enough yarn for one of its projects. Good luck!! I've been following along on the tour - what lovely items! It has also sparked my interest in learning a lot more about the Folly Cove folks. Beautiful patterns! Julia hits another one out of the park. Never knew about the Folly Cove collective until she brought it to our attention. I wonder if any of the members were affiliated with the Montserrat School of Art (which was what it was called when I was going to university in Boston an ice age ago). Some how I missed the blog tour, but very glad to catch the tail end at least. I really like the Natti Turtleneck. I'm always cold and wear turtlenecks all winter. Thanks. I have enjoyed following the blog tour and I would love to win the patterns and yarn. My rav name is janineny2001. I really enjoyed learning about Folly Cove and seeing some of the patterns! I'd love to curl up with the book and a project! Just in time for a new winter project, exciting! Thanks, Julia. Love this collection and love my Annisquam beret that I just finished. Would love to win some yarn to make some of these other lovelies! I love the inspiration and the patterns!! Beautiful knits. Had great fun on the blog tour too! Some beautiful items in the collection. This is an awesome collection. I'm not sure which one to knit yet. Beautiful! Julia has outdone herself! Beautiful, as always. I can't wait to get started on a new project. I found the tour about halfway through, but was delighted to catch up! Julia's always been a great writer, and it's lovely to see other people recognize that. I have been following the tour up here in The Great White North. Beautiful book. Such an interesting collection and so enjoyable to learn about the background of the Folly Cove designers. Love Natti! there are some really cute patterns in this book. Love Burton Hills Jacket! Thanks for the chance to win. I love Hetty's Garden Coat and the Butterfly Cowl, but I really LOVE Hetty's Garden Coat. Thank you for the chance to win....hope I do! I love the hat on the cover! Love learning about the history behind the book. Mille grazie for the give away. So many beautiful patterns. It's hard to decide which one to start first! Beautiful designs; I can see a Meteori Shawl in my future! I would just love to win the Folly Cove book. So very lovely! Classic Elite is my favorite yarn. Beautiful! Vintage! Classic! Timeless! I would love to make this for my daughter, & also myself! This is truly a work of art! Such beautiful patterns & knitting! I really love Julia's designs. I love Meteori! Would be great to win this book! Long time Classic Elite fan and am delighted to see a CE book with Julia's patterns. Oh very nice book, love the hat! such a great book! can't wait to bring one home!